Auto-runners are a dime a dozen, but there’s hardly any game that’s as gorgeous as the Little Fox. 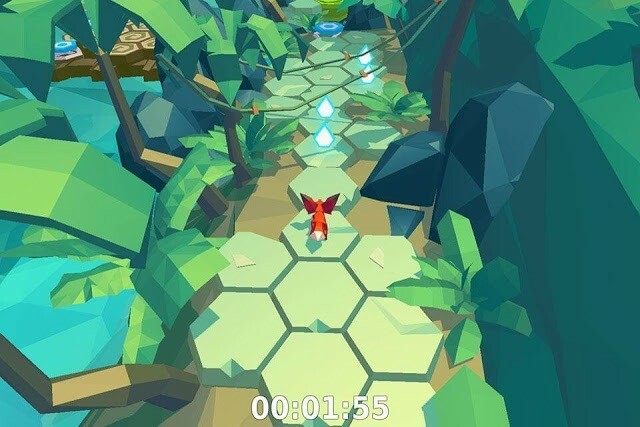 Developed by H8 Games and published by Zplay, this delightful auto-runner is pretty easy to play, but as you move from one level to another, controlling the fox becomes a challenge. Each world has paths made up of hexagonal tiles. The fox runs automatically on these tiles and you will have to tap the left and right side of the screen to make him turn. You must tap before the fox moves out of the path and so you will have to keep an eye on sharp turns to avoid falling off the tiles. At times you will see a path branching into two different paths. Choosing the correct path will help the fox reach his destination faster. Some paths may contain more teardrops than others, but are designed in such a way that it may take several tries before you can successfully move past them. You will also notice that some hexagonal tiles are different from others. These are special tiles that can help your fox or make it difficult for him to run. Landing on blue and white “bulls-eye” tiles will make him jump from one path to another. Green spiral tiles will make him run faster. There are also tiles that can slow him down. Such “poisonous” tiles can be identified by the bubbles coming out of them. New special tiles keep appearing as you explore new worlds. A mini-tutorial will explain basic controls and special tiles. The first world is easy to complete, but later on, levels can be very challenging and it may take several retries before you can finally succeed in reaching your destination. The game’s tough, but fun to play and you won’t feel bored even after repeated attempts. It has an energy system that refills over time. There are two ways to use energy: 1) To restart a level and 2) To begin where you left off. I would recommend you to choose the second option because at times you may be a few tiles away from your goal and you may want to start from that point. The Little Fox boasts gorgeous graphics. Everything from the fox to various environments such as forests, burning volcanoes, dark caves and icy cold regions is perfectly designed and looks great on your mobile device. The lovely environments, along with the serene background music will make you instantly fall in love with this game.